Elizabeth Harris Gallery is pleased to present Upland, an exhibition of new work by Ron Milewicz. This will be his fourth solo exhibition with the gallery. It will feature paintings and drawings based on the rural landscape of upstate New York. For two years Milewicz made drawings in the woods, approaching nature simply and directly with only pencil and paper. In these intimately scaled portrayals of trees, meadows, ponds, and skies, the silvery graphite is seemingly soaked into the soft cotton paper. Critic David Ebony writes in his exhibition essay: “Milewicz trees are no ordinary specimens . . . the trees appear as spectral presences. 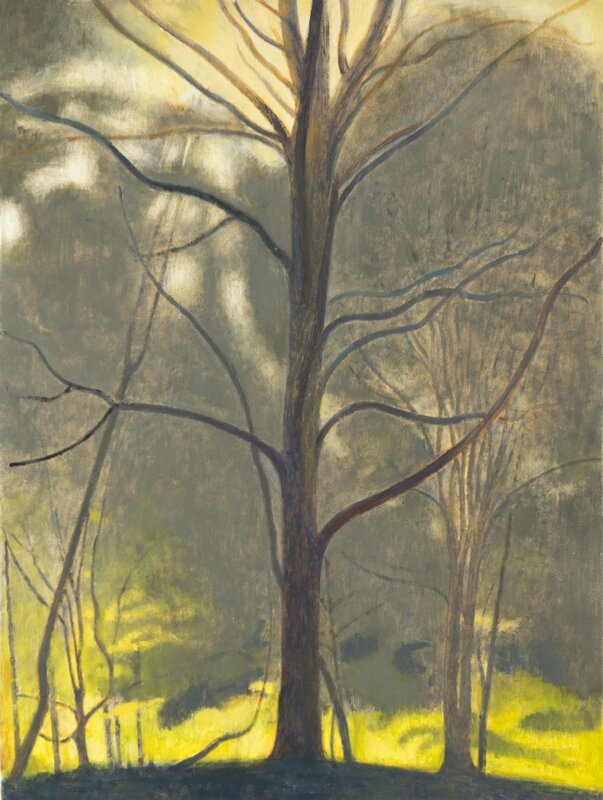 Nurtured by ethereal light, crystalline air, and vaporous clouds of moisture—conveyed by finely nuanced tonal shifts—these ancient, ancestral trees possess firm roots and an insistent verticality.” Milewicz’s absorption into nature is evident, and the drawings are suffused with solitude. Milewicz began making paintings of his drawings of landscapes. Relying on memories that are as much emotional as visual, Milewicz’s paintings are faithful to both interior and exterior experience. They regard nature as a spiritual wellspring, a view Milewicz shares with artists ranging from the Chinese scholar-painter to the American Luminist. His works assert the overwhelming truth of Nature’s elemental and mystical power. Reverence, however, is not confused with nostalgia. Conscious of the contemporary existential threat to Nature, Milewicz's depictions of landscape can be seen as elegies for the landscape itself. They present Nature’s force along with its vulnerability, silently marveling at the central miracle of being while admitting the miraculous fact of inevitable dissolution. Ron Milewicz was born in 1963 in Brooklyn, New York. He studied biology and art history at Cornell University (1979-83), received a master’s degree from Columbia University Graduate School of Architecture (1983-86), and attended the New York Studio School (1990-1994) where he has taught drawing and painting for a decade and a half. He has exhibited nationally and internationally, has been widely reviewed, and is represented in numerous private and public collections. He lives and works in Queens, New York, and Gallatin, New York. The gallery is located at 529 West 20th Street, 6th floor, and is open Tuesday – Saturday, 11-6. A reception for the artist will take place on Saturday, January 6 from 3-6 pm. I will be participating in the New York Studio School 2017 Benefit Auction. Lots of great works will be up for grabs! I will be showing the new painting Hill Top 1 in Elizabeth Harris Gallery's summer show. Please stop by. Wednesday, May 24, 6-9 pm. Hundreds of 5 x 5 inch works will be available for sale, each priced at $100. The thrill is that all work is anonymous until after the purchase. Test your luck and your artist eye with this exhilarating sale. All funds raised support scholarships! In honor of the New York Studio School's 50th anniversary, comes Part II of work by artists who are associated as faculty members of the school; past and present. The exhibition explores "The Presence of Form" - an aesthetic idea that links the teaching philosophies of distinct individuals who have had a presence over the School and influenced generations of artists. The exhibition traces this borough’s unique history and landscape from the 17th century to the present. These works are made by amateur and professional artists, working in a broad range of styles and materials from ink drawing to anaglyph 3-D video. Artists include the masters of the Hudson River School such as Edward Moran and Jasper Cropsey, a native Staten Islander, Cecil C. Bell, who lived on Staten Island and current talents. I will also be participating in a panel discussion on Sunday, November 15 at 2 pm, located at the museum. Elizabeth Harris Gallery is pleased to present its third solo exhibition of new paintings by Ron Milewicz. 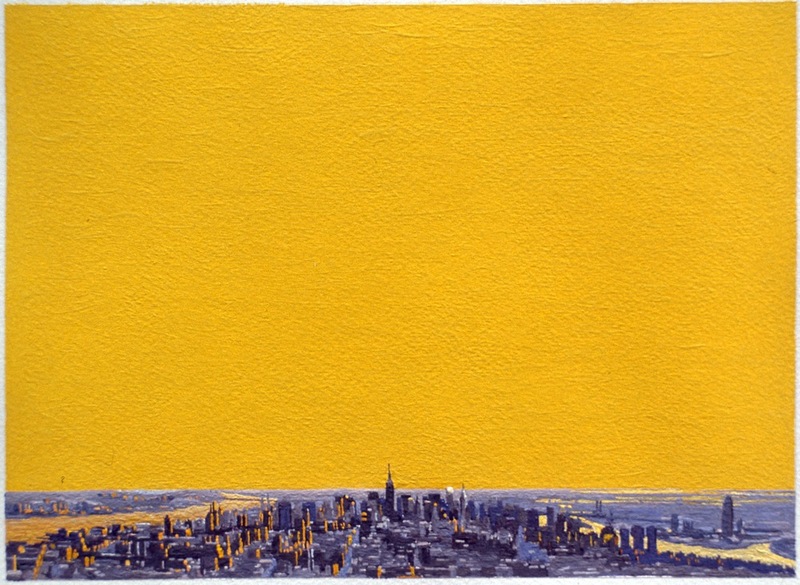 Acclaimed as a painter of the urban landscape, in his new works Milewicz turns to painting objects in order to regard the life of his father, Eli Milewicz. The elder Milewicz, who died in 2012 at age 98, was a tailor who survived Auschwitz, three other Nazi concentration and forced-labor camps, and two death marches. The artist has chosen, from the facts of extraordinary experience, to depict ordinary objects – a shovel, bricks, spools of thread, an overcoat, a leaf. The paintings surprisingly and uncannily address, without bombast, fundamental issues raised by surviving an atrocity of inconceivable cruelty and scale. As poet Tom Sleigh writes in the catalog essay: "Milewicz’s images are suffused with a kind of metaphorical double vision...whatever the literal object in the painting, that object is both itself and something more. And that something more is always disturbing, not in some vague way, but in a way that feels deeply personal to the painter, meditated over, wrestled with, approached head on, then edged away from ---- as if the images were as much a psychic invitation as a psychic threat to both painter and viewer...These paintings make serious demands on the viewer. They are at once symbolic, historical, and personal. They refuse to stand aloof from biographical circumstance, but demand that viewers come to them prepared to intuit some deeper private resonance." The gallery is located at 529 West 20th Street, 6th floor, and is open Tuesday through Saturday 11-6. A reception for the artist will take place on Thursday, September 12 from 6-8 pm.